Tomorrow marks a year since the mammoth 7.2-magnitude earthquake that decimated much of Haiti, claiming lives by the hundreds of thousands, consigning a million more to a still-ongoing life in tent cities, destroying much of the already fraught infrastructure of the West's poorest country, and leading to a significant outbreak of cholera over recent months. In light of the day, Catholic Relief Services has filed reports from its continuing efforts on the ground, and the USCCB has released a slate of resources to observe the milestone, including a set of briefings and a novena beginning tomorrow to Our Lady of Guadalupe, Mother of the Americas (even if, perhaps, a more fitting choice would've been Haiti's own patroness, Notre-Dame du Perpétuel Secours -- Our Lady of Perpetual Help). Meanwhile, with the ravaged half-island's top ecclesial post still vacant following the death in the disaster of Port-au-Prince's Archbishop Joseph-Serge Miot, a sketch of the challenges that remain has emerged from the Stateside church's longtime lead hand on Haitian affairs: Archbishop Tom Wenski of Miami. The full-time pastor to South Florida's Kreyole diaspora -- the US' largest concentration of Haitian expats -- for 18 years of his priesthood (and one who still mutters his offertory prayers in its language), Wenski's cult-like following among the community and decades-long bond with their bishops back home, combined with a trans-cultural force of personality and fluency in policy, have arguably made him the linchpin figure in coordinating the global church's significant involvement in the reconstruction process, which began moving with a pan-Catholic September summit organized by the Miami prelate. One year ago, perhaps the worse single urban catastrophe in modern history befell an already much too beleaguered Haiti. 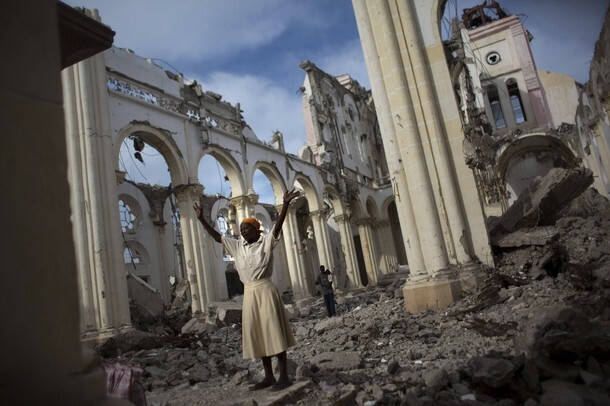 Goudou-goudou, the onomatopoeic Creole word for the January 12, 2010 earthquake, took some 300.000 lives and cost billions in destroyed property and infrastructure. And while, in the immediate aftermath of the region’s biggest disaster in 200 years, the island nation avoided the predicted outbreak of disease and social disorder, 2010 ended with both – a still uncontained cholera epidemic that has claimed more than 2,000 lives and widespread civil disorder due to flawed elections that threatens to undermine the legitimacy of a new government. The earthquake, however, has not so much created new challenges as it has laid bare for all to see those that have piled up over a very long time. This explains why one year later there is so little evidence of Port-au-Prince rising from the dust and ashes of the earthquake one year ago. Much rumble and debris has yet to be removed; rebuilding projects wait for the government to promulgate new building codes; and what reconstruction that is happening is hobbled by lack of materials – even construction grade sand is in short supply. One can be tempted to be inpatient – but recovery from natural disasters has been slow even in the resource rich United States. It took years for South Dade to recover from Hurricane Andrew and New Orleans – five years later – is still struggling to overcome the effects of Katrina. But the goudou-goudou was more than just a natural disaster – stronger quakes hit Chile and New Zealand in the same year with less destruction and loss of human life. What brought Haiti to its knees was not so much the shifting of its tectonic plates but its grinding poverty. For this reason, one cannot simply rebuild Port-au-Prince the “way it was”. For what was, was inherently unsustainable and inhuman: at the time of the earthquake, some 3 million people (a third of the nation’s population) eked out a miserable existence in concentrated area whose public infrastructure.- health care and utilities – was built for about 100,000 people, mostly during the American military occupation from 1915-35. Nor can one attack the challenges of “rebuilding after the earthquake” without addressing the endemic problems of the entire country. 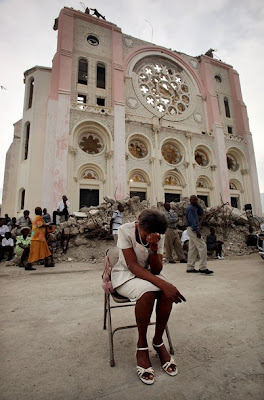 In fact, while the earthquake laid bare the problems of over urbanized Port-au-Prince, it led to the neglect of the rest of the country by both the Haitian government and international aid agencies. Refugees from Port-au-Prince returned to their ancestral hometowns where they lodged with relatives putting strains on local food supplies, schools and hospitals. But, with all the attention focused on Port-au-Prince, little assistance reached the provinces – which led to most of these “refugees” making their way back to Port-au-Prince swelling the already overcrowded tent cities. The agricultural and rural areas of Haiti need help to achieve basic sustainable development. There is a need to decentralize: too much of the existing government services, the economic activity and the population’s access to jobs, healthcare and education are centered in Port-au-Prince. For over three generations, this centralization has driven landless peasants into Port-au-Prince. They lived in housing that lacked the rudiments of modern life, along unpaved roads and potholed streets without access to clean water, sanitation or reliable electricity. Many of these structures were built with the help of relatives in the United States who still help keep Haiti’s economy afloat with small but regular transfers of cash. According to the Inter-American Development Bank, perhaps some $15 billions of remittances over 25 years became deadly rubble in just 60 seconds on January 12th. And now, their homes destroyed some 1.3 million of them live under tarps in tent cities that dot the greater Port-au-Prince area. Critical to Haiti’s recovery and development, is a clear, long-term commitment from the United States and other friends of Haiti. The new Congress should revive The Haiti Empowerment, Assistance and Rebuilding Act (HR 6021). This bill would provide a framework to guide long term assistance to Haiti. At the same time, it would encourage both the Haitian government and civil society to look beyond immediate needs and plan for the future. Millions have been spent in humanitarian assistance; millions have been pledged for recovery assistance. Haiti needs an effective plan for U.S. aid that provides a coherent framework for such assistance, commits at least medium-term funding and creates some stability and direction for the reconstruction and development programs. The bill authorizes funding to be appropriated over five years and more importantly establishes a framework that can guide long-term assistance to Haiti. Such a plan would create the stability and predictability necessary for U.S. assistance to support the Haitian government in governance and capacity building. It would also enable Haitian society to have a say in development programs that can bring stability to the country. The plan would encourage the Haitian government and civil society to look beyond the immediate needs and plan for the future. It engages different sectors (government, agriculture, textile, labor) in working together to take advantage of predictable assistance from the United States and other international donors. HOPE II, passed in 2008, which affords goods assembled in Haiti duty free access to US markets, also potentially could bring thousands of jobs to Haiti. Haitians when given the opportunity to work – whether at home or abroad – have proved to be most productive. Free-trade zones established outside of Port-au-Prince on land not now used for agricultural productions can create new jobs and help decentralize the capital city at the same time. However, for any of this to succeed requires on the part of the US and other donor countries a new resolve to hold Haitians (and their foreign partners) in both the private and public sector accountable. Rather than further contribute to the dependency created by the “misery industry” present in both governmental and non governmental organizations, U.S. policy should be guided by a mix of generosity and hard-nosed realism. Haiti is a cemetery of “aid projects”. The good intentions alone will not put Haiti on the road to sustainable prosperity, also needed are hard work, effective planning, and the production of goods and services that people around the world need and want. Twenty five years have passed since the end of the Duvalier dictatorships. Yet the Haitian proverb, Ki mele pis grangou chen (What concern is it to the flea that the dog is hungry?) has too accurately described the failure of Haiti’s political classes to live up to the aspirations of the Haitian people for accountable and transparent governance. As the scandalous “inefficiencies” of Haiti’s sole international port still show, the “kleptocrats” in and out of the government have more sway than the “democrats”. These “kleptocrats” that operate in and out of the government need to be sidelined if the Haitian people’s aspirations for a future of hope are not to be frustrated yet again. And there is no better place to start than with the Port Authority of Port-au-Prince. Since most of Haiti’s imports originate in South Florida, perhaps the State of Florida or some federal agency could (for a fee) pre-clear and collect any duties on exports destined for Haiti. This would guarantee a steady flow of revenue to the Haitian government, eliminate costly delays of containers held up for weeks over “paper work” that is only an excuse to solicit bribes, and potentially open up Haiti’s other provincial port cities for development. Efficiently run ports would give the growth of labor rich assembly plants made possible by HOPE II a chance to succeed. The new government of Haiti should seek such partnerships – rather than reverting to business as usual. We cannot walk away from Haiti – a neighboring country of nine million people only 800 miles away from Miami. We all, including the Haitian Diaspora and their children living in the U.S., have a stake in making this work.